Receive actionable information from the sky for better, real-time decisions across residential, commercial, industrial, and other assets. DroneBase provides high-resolution aerial images, video, and maps across the country for properties and work sites of all types. Our proprietary flight plans include thorough roof & equipment inspections, landscape review, parking lot & common area maintenance, investor & regulatory due diligence, natural disaster outcome, marketing & sales, and many more. Drones can obtain imagery on pavement conditions so you can find stress cracks and wear faster than ever. Safely inspect hard to access areas with standard or thermal imagery to evaluate roof conditions, water damage, and more. Illustrate proximity to nearby roads and other features with a bird’s-eye view and angles only a drone can capture. DroneBase is the best-in-class, nationwide drone service provider for aerial imagery & data. We’ve flown tens of commercial drone flights providing reliable, high-quality aerial data of commercial, residential, and industrial properties as well as other critical assets and infrastructure empowering Property Management companies to make faster, better decisions. We’re the nation’s leading provider of drone operations across industries, powered by the largest network of professional drone pilots in the world. DroneBase has been trusted at tens of thousands of properties and worksites across the world with professional pilots in every state and over 70 countries. We are focused on safety, standard of quality, and hassle-free operations with great customer service. Our vetted & trained pilots are insured and compliant with regulations. We’ve partnered with leading analytics companies to easily integrate into your existing workflow. As the world’s most trusted Drone Service Provider, we will deliver ROI-positive results that outweigh building an in-house drone program. DroneBase operates a network of qualified drone pilots who are trained and experienced to fly for property inspections, parking lot surveys, real estate marketing, and more. All pilots are vetted and tested for professionalism and quality. We are permitted to fly for commercial use and insured at every job site. DroneBase has completed tens of thousands of commercial drone flights - more than any other drone service provider in the world. Depending on the package you order, we provide high-resolution aerial images, HD video clips, edited marketing videos, or the raw aerial data you need for your analytics software. 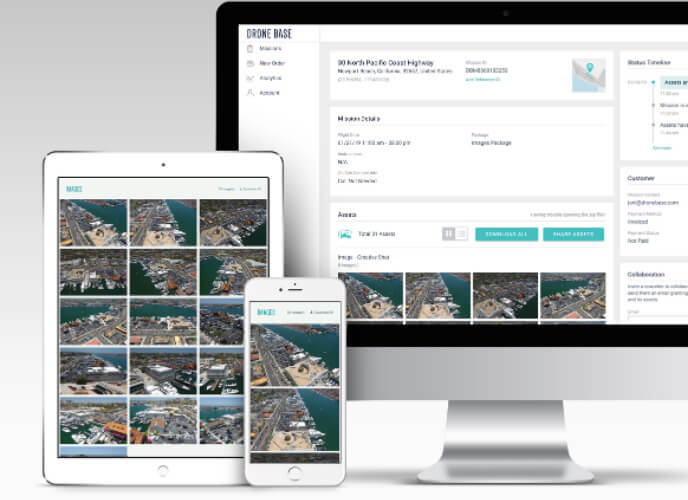 We host the images and videos in your DroneBase account so you can easily download, share with colleagues, and more. All the data is yours to own and use as you like. We take care of all pre-planning, safety checks, asset management, and quality control. Once your order is received, DroneBase will visit and fly your site within a few days (subject to weather) and will deliver your assets within a few short days of the flight. Placing an order only takes minutes through our user-friendly Client Dashboard or can be done at scale with our API integration. As your single point of contact nationwide, DroneBase ensures a high standard of quality and fast turnaround time, every time.